With bicycling season now in full effect Canadian cyclists are taking to the roads; but how they can arrive safely at their destination is a constant concern in communities large and small. Whether it’s encountering distracted drivers and pedestrians, construction, road obstacles, or other cyclists who don’t follow the rules, safely sharing the streets is a daily adventure. 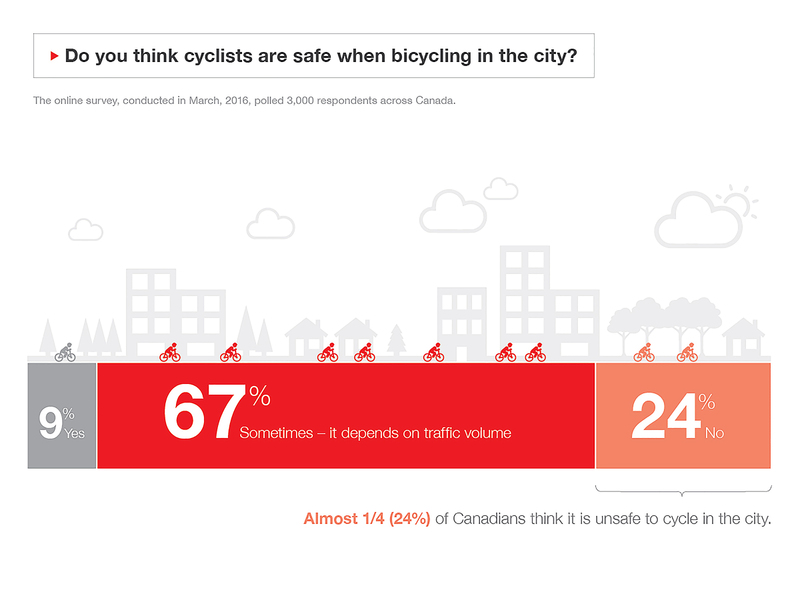 So it’s not surprising that one out of four Canadians think that it’s unsafe to ride a bicycle on city streets. Do you think cyclists are safe when bicycling in the city? 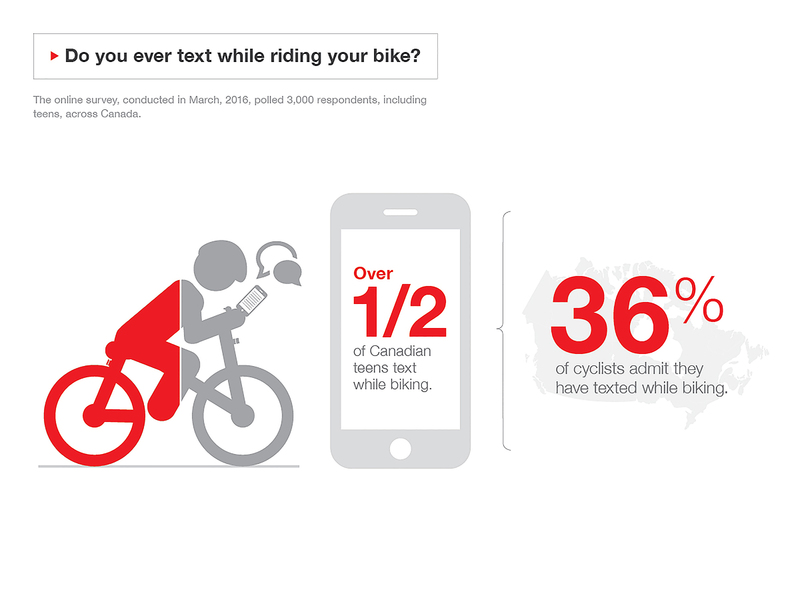 Do you ever text while riding your bike? 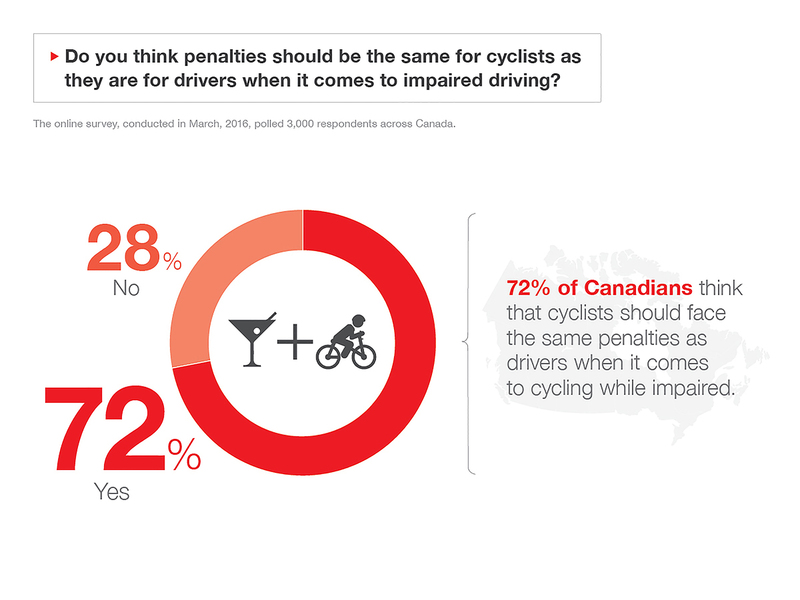 Do you think penalties should be the same for cyclists as they are for drivers when it comes to impaired driving? Do you find motorists/cyclists annoying while riding your bike/when driving? Friction between cyclists and motorists is well-known. 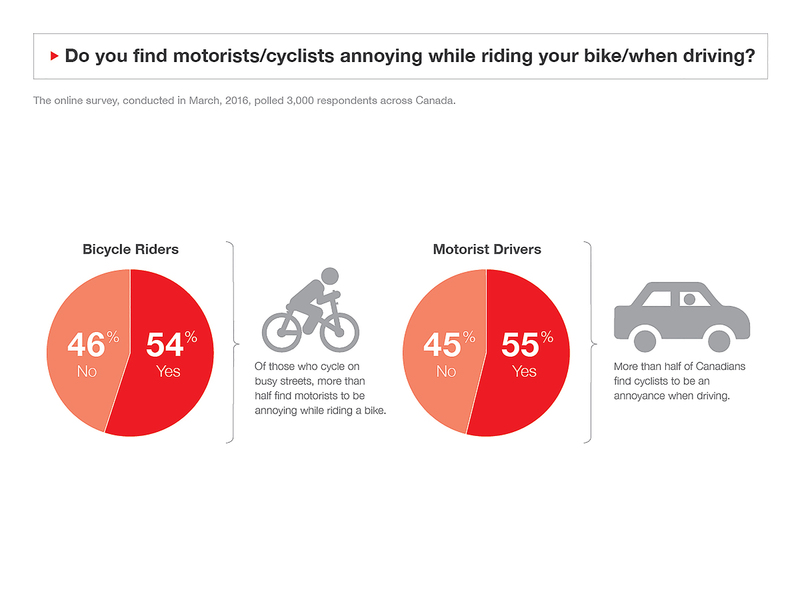 According to a recent national survey from State Farm Canada, 55 per cent of Canadian drivers find cyclists to be an annoyance on the road. But it’s a two-way street, almost the same number (54 per cent) of cyclists find motorists to be annoying while they’re biking. It’s understandable that the busier the street, the higher the level of danger is for cyclists, but that does not deter everyone. 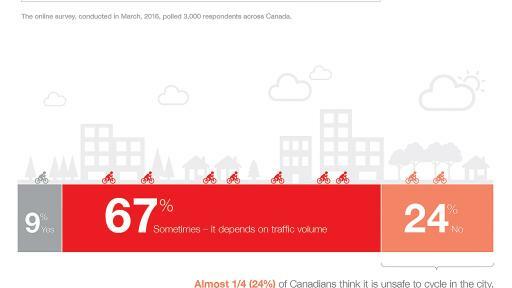 Almost 20 per cent of survey respondents state they bike on busy streets. Of those respondents who do, more than half have either personally been in, or know someone who has been in an accident while cycling on the road. Cycling can be dangerous enough, according to Statistics Canada close to 7,500 cyclists are seriously injured every year, but the danger increases if a cyclist is impaired or distracted. 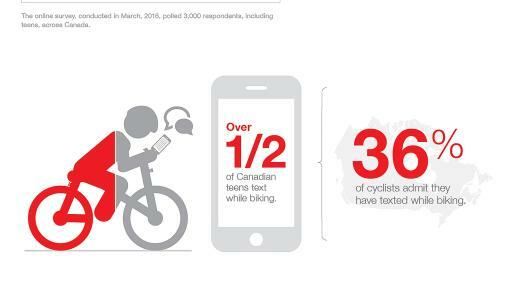 Alarmingly, 36 per cent of cyclists who say that they ride on busy streets and more than half of Canadian teens admit to texting while biking. When it comes to cycling impaired, more than 72 per cent think cyclists should face the same penalties as drivers. There are small steps cyclists can take to better ensure their safety - eight out of 10 respondents think cyclists should be legally required to wear a helmet. Making sure cars are able to see and hear them by having a bell and lights or reflectors is also important. 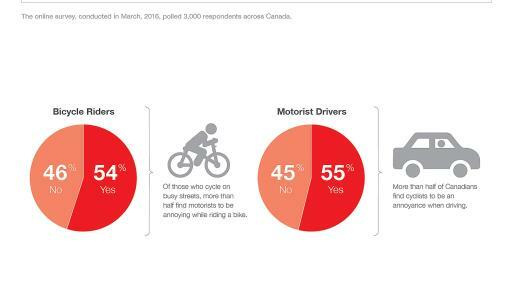 Unfortunately, almost 40 per cent of Canadians are unaware and don’t know that cyclists are legally required to have a bell and lights or reflectors equipped on their bike. Giving the appropriate amount of distance when passing those on a bike, especially when there’s no designated bicycle lane, is important. 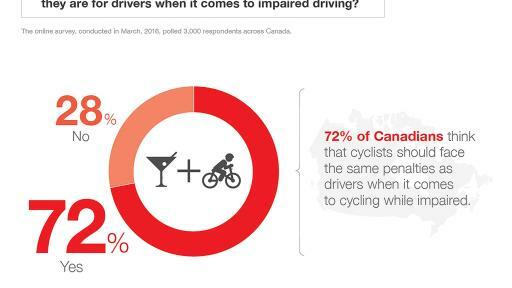 However, almost 45 per cent of Canadians state that drivers should only give cyclists one meter or less when passing them on the street. 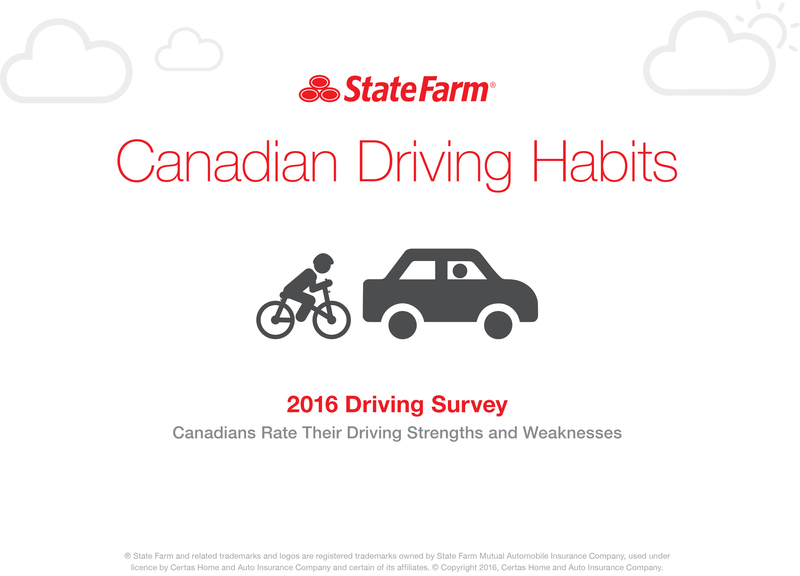 This is the second of three news releases State Farm will distribute in 2016 revealing survey results and the opinions of Canadians about their driving habits and road safety. 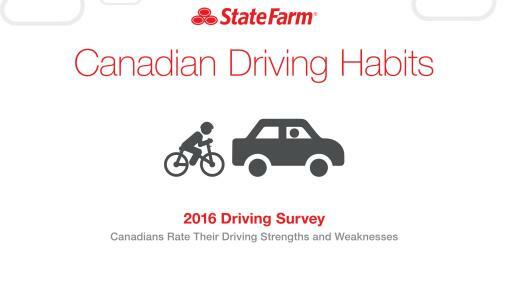 The online survey, conducted in March, 2016, polled 3,000 respondents of driving age across Canada. ©Copyright 2016, Certas Home and Auto Insurance Company.